This listing is for the entire reading series from Quality Montessori. Montessori Phonetic Reading Blocks, Silent E Reading Blocks and matching 3-Part Cards are perfect for the beginning reader. Your child will delight in twisting the blocks to discover new letters and lots of words, especially ones that rhyme and even long vowel, silent e words. Show your child a picture card and see if they can find the word on the phonetic blocks! 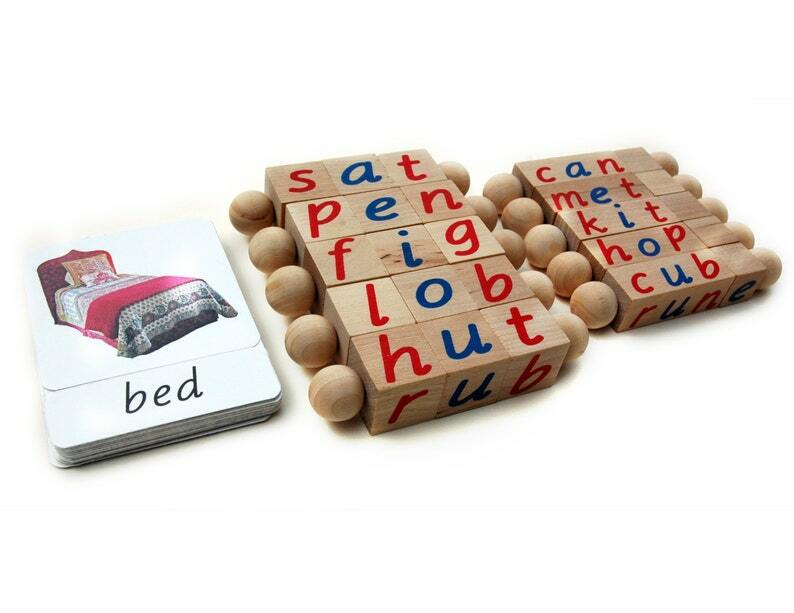 The Montessori Phonetic Reading Blocks are perfect for the beginning reader. Your child will delight in twisting the blocks to discover new letters and lots of words, especially ones that rhyme. A great way to transition from learning letter sounds to actual blending and reading! The Silent E Reading Blocks are great for introducing long vowels to young readers. 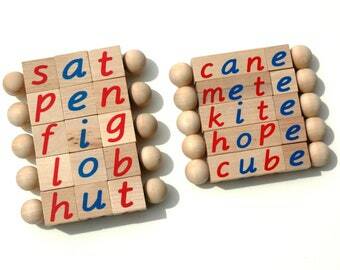 Once your child has mastered reading the three-letter Phonetic Reading Blocks, introduce these Silent E blocks. Your child will love twisting the end block to reveal and hide the Silent E to create words with both short and long vowel sounds. Easy to use, first show the child a 3 letter phonetic word of your choice. Have the child read the word. Then, twist the block so that the "e" appears at the end of the word. Explain to the child that in this word, the "e" does not make a sound, but it does have a job. Tell the child that the "e" makes the vowel say it's name. For example: man becomes mane, fad becomes fade and so on. Practice reading the new word together. Show the child another word with the same vowel. Continue reading words in this manner, helping when necessary and eventually moving on to other vowels. The Phonetic Word 3-Part Cards are a great addition to the Montessori Phonetic Reading Blocks. Introduce vocabulary, play memory, match picture to picture, word to word and word to picture cards. Children can also play matching games by drawing cards and twisting the blocks to match or even make their own picture book. These cards feature 15 different consonant, vowel, consonant (CVC) words, all of which can be found on the Phonetic Reading Blocks. Each word includes three parts: 1 picture card, 1 word card, and 1 control card with the picture and word together for a total of 45 cards. The cards are printed on 100-lb. Premium, High Gloss, Recycled Card Stock and then cut with the corners rounded. Lamination is available and recommended for classroom use. The reading blocks are made to replace or compliment your Montessori Three Letter Phonetic Word Cards and your Montessori Silent E Word Cards. The letters are written in lower case d'nealian print with red consonants and blue vowels, in order to match the rest of your Montessori Language materials. A must have language work for the Montessori 3-6 year old classroom. 5 Phonetic Reading Block Rods w/ middle sounds A,E,I,O,& U. Each one is 4.5 inches long by 1 inch tall. 5 Silent E Reading Block Rods w/ middle sounds A,E,I,O,& U. Each one is 4.5 inches long by 3/4 inch tall. A list of definitions to keep your little ones informed. A set of nomenclature cards - 45 Cards Total -15 Control Cards - 3 by 4 inches, 15 Picture Cards - 3 by 3 inches, and 15 Word Cards -3 by 1 inches. 1 Organza Bag to keep cards together. Handmade with natural unfinished wood and non-toxic ink and glue. Sets may have slight imperfections/variations since each one is handmade & unique. CHOKING HAZARD: Small parts. Not for children under 3 years old. ALL RIGHTS RESERVED. Made in the USA with Imported Parts. Created with Love by a Certified Montessori Teacher. For individual picture credits, please contact me. Your gift will be wrapped in yellow glossy paper with five colorful satin ribbons. Quality blocks. My kids love them. Thank you so much for these reading blocks. My son is having a great time learning to read with them. He plays with them often, even when we're not doing "school time". He likes to play the games with the cards too. I'm looking forward to using these with all 4 of my kids. They're sturdy and well made, I know they'll last a long time. Thank you! I accept all major credit cards, checks, money orders and Bitcoin. If paying with check, money order or Bitcoin, please use ‘Other’ as your payment method when checking out. Then write the payment method you’d like to pay with in the “Note to Seller” field. Once the order has been placed, I’ll contact you with specific instructions for payment. Your order will be shipped once your payment has been received and cleared. If there are any problems with your order or if you decide you don't want it, you may return it within 30 days for a full refund or exchange. Please note that unless damaged, I cannot accept returns for commissioned pieces. Custom orders are welcome, including custom paintings, logos, watercolors and print designs. As the price will vary depending on the size of the project, please contact me for pricing requests and visit www.ArtworkPortfolio.com to view my portfolio.